These tours enable cultural exchange between students across the world, who ask questions and identify one another through their respective traditions, music, dance, and art and craft, informed Kumar. Some of the collaborations have also addressed issues like the United Nations' sustainability goals, migration and racism. Imagine your child gets the opportunity to witness the wonders of the world, interact with children from different parts of the globe and learn about current world issues, all while sitting in a room. He or she is given a first-hand experience of the topography of places and their respective socio-cultural make-up beyond what is taught in textbooks, through virtual classes. Express Parenting got in touch with educator Shiva Kumar, a virtual master teacher, who is now conducting such virtual sessions with school children. 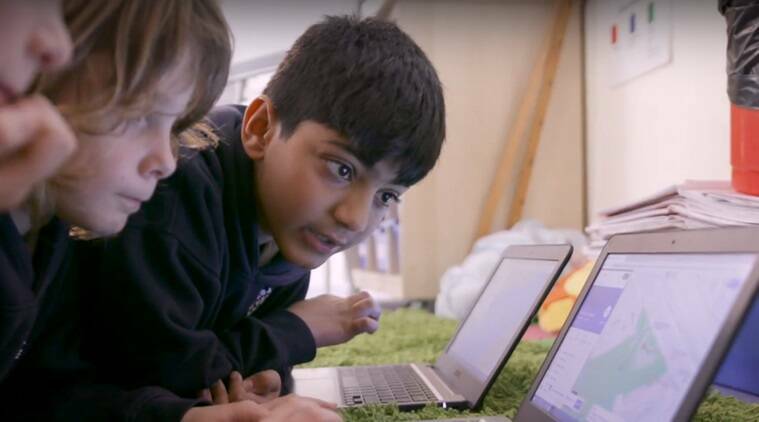 More and more children are enrolling in virtual educative tours, which connect them–even those from the remote corners of the country–to educators who make them travel virtual miles to foster learning. One such initiative, from Microsoft, holds virtual tours through Skype whereby children are taught on various topics ranging from history, computer science, mathematics to issues surrounding human rights, cyber security, and inclusiveness, to name a few. Kumar, Asia’s first Skype Master Teacher, who has been conducting the tours for the past four years, quit his corporate job to follow his passion for teaching. “Education has been my passion from the beginning. After conducting seminars on emerging technologies and being a member of the academic board at prestigious colleges in the country, I soon realised that to bring a real change in the education system, I should begin at the school level. I realised the limitations of school education, given how students are loaded with a huge syllabus followed by examination,” said Kumar. That’s when the opportunity of becoming a Skype master teacher came up. After some reluctance initially, Kumar finally joined the initiative. This year, the fourth edition of Skype-a-Thon was held in November, which saw participants from 102 countries travel a total of 23 million virtual miles in the span of two days. Nearly 11,000 students from over 300 schools across India took part, covering 4.26 million virtual miles, the most by any country globally. An attempt towards empowering students and teachers, these tours enable cultural exchange between students across the world, who ask questions and identify one another through their respective traditions, music, dance, and art and craft, informed Kumar. Some of the collaborations have also addressed issues like the United Nations’ sustainability goals, migration and racism. They are taught about the latest researches in the field of science, and taken on virtual tours to zoos and historical sites, apart from exploring a host of other areas. Kumar currently teaches children, between the age of seven and 15, both from urban and rural areas, in Andhra Pradesh. “We started off with only 10 kids. Today, we have around 60,” Kumar said. The sessions are usually held once a week. Children are not evaluated through conventional examination. It is majorly based on observation and then guiding and training them accordingly. As healthy as this experiment sounds, convincing parents in India, especially after they have long integrated themselves and their children into the country’s conventional education system, has obviously been an arduous task. After all, for many of us, academic curriculum is the pathway to securing a job in future and not merely about the joy of learning. “Parents were initially worried that it was a waste of time. But once the practical sessions started, they found it to be encouraging. That said, such form of learning is yet to become mainstream. A lot of parents are still unaware or apprehensive. Most of the kids who have enrolled in the virtual classes are those with relatively progressive parents,” Kumar expressed. In fact, awareness sessions are also held for parents at regular intervals, he asserted. These virtual Skype sessions are mainly held in collaboration with schools although students can also apply individually. “Anyone applying individually, needs his or her parents or educator to go to the Microsoft education portal, interact with an educator of their choice and filter out the subjects of interest,” Kumar explained. Interestingly, schools in rural areas showed better responsiveness compared to their urban counterparts, according to Kumar. “Children coming from the rural areas are very hardworking and smart, except for their communication skills. But the confidence that these children build through these sessions helps bring down the barrier,” said the proud teacher. Parents don’t really have to worry about affordability. It is accessible as long as one has an internet connection, he stated. Kumar has also initiated ‘Skype2Village’, a social drive to assist kids in Indian rural schools to experience learning beyond borders. Is unschooling the way forward? According to Kumar, this form of unschooling is a more effective process. For the uninitiated, unschooling is a recent trend in which students lead the way in directing their learning. “A lot of learning happens when kids are left to explore on their own. With unschooling, there’s less rigidity and a better scope of interaction. Creatively, a child tends to lose a lot by going to school, given the kind of curriculum most of them have. One needs to realise that learning is not just about textbooks and marks. Parents shouldn’t just be interested in the end product but be interested in the process too,” he signed off. 2 Does screen time addiction rewire kids’ brains?